This is a quick guide to getting started and running your first test. We thought it would be helpful for those getting started and checking their first calibration before running tests with actual samples. We will also continue to explore and share more information about calibration options, general maintenance, and data export methods using the DA-130N portable density meter. O.K. Let's install three 'AAA' batteries to get started. And then attach the sampling nozzle. A few words about precautions when taking test measurements. 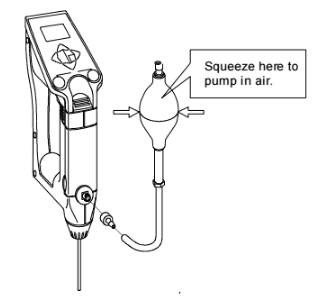 When measuring a sample make sure to hold the instrument so that the sampling nozzle is vertical to the ground. 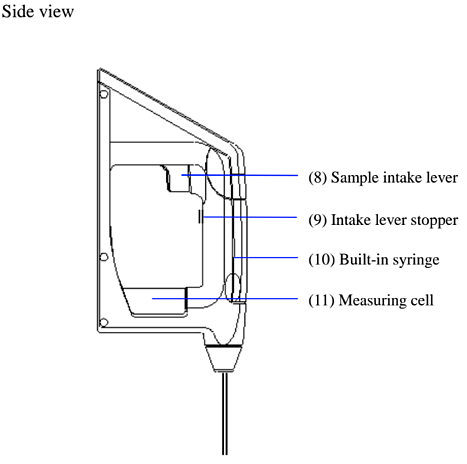 When laying down the instrument between or after measurements make sure to drain the remaining sample from the built-in syring (the built-in syringe is located inside the meter right above the sampling nozzle). Now let's run a preliminary test using water. Leave the temperature unit (Celsius), measurement unit (g/cm3) and mode (Field) as initial values. Sample pure water using the built-in syringe. After the measurement cell is filled with sample liquid make sure there are no air bubbles in the cell. If no air bubbles are visible then let's proceed. Example procedure for running first test. The display changes as above and after confirming it is in the automatic stability sense mode. Press [Meas.] key. When the displayed density is stabalized the value will automatically change reversed as below. Read the data at this point as well as the temperature degree. Look up to the pure water density table (appendix 1 in the manual). 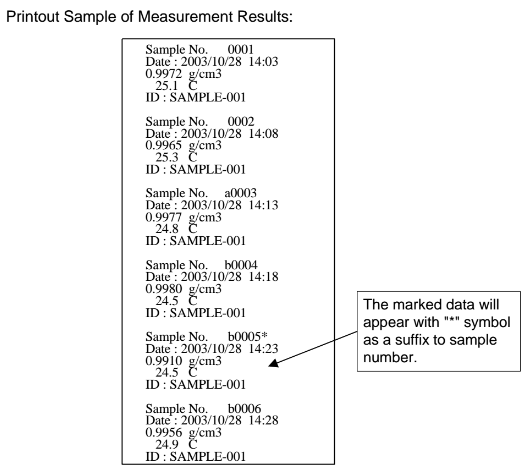 If the results agree within +-0.001g/cm3, you can proceed to making your sample measurements! Note: If the results are not within the acceptable range then the measuring cell requires calibration. Set calibration mode to OFF. Press the [esc] key 2 times to return to the main menu. Sample pure water making sure no air bubbles are visible. 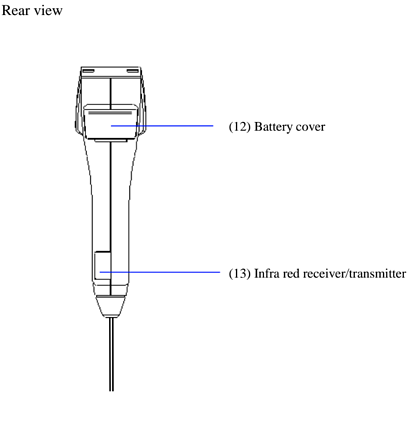 The measuring cell with pure water can be calibrated automatically with the key entries as follows: Press [cal.] key for more than 2 seconds to show CALIB(Water) (inversed colo on the display) showing calibration with pure water in progress. After calibration is over the deviation from the theoretical value will be shown so that you can check if the calibration has been successfully completed. Note: if after attempting re-calibration of the measuring cell and results are still not within specifications it is possible the measuring cell itself is contaminated. In this case ensure to carefully clean the measuring cell and then re-calibrate again. Note 1: You can also calibrate with a standard liquid that has a known density. Sometimes calibrating with a liquid that has a similar density to your test samples will help improve precision. Note 2: You can also calibrate with air. You can thoroughly clean the measuring cell with just pure water. You can also improve the cleaning of the measuring cell by using Ethyl Alcohol. Ethyl Alcohol gets rid of dirt that cannot be removed with pure water and also reduces the amount of time to dry the measuring cell. 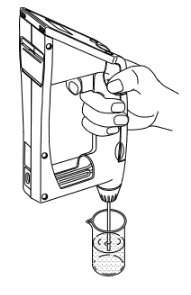 When using the optional manual pump to dry the cell make sure to clean the cell first and then press the sample discharging lever all the way down, and push the sample intake lever upward to lock it. 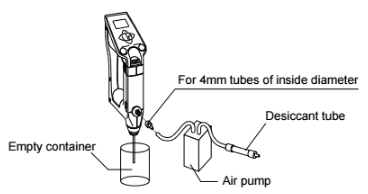 With the adapter for the syringe attached connect the kit as illustrated above and feed air forcefully using the manual bulb. How to replace the built-in syringe. 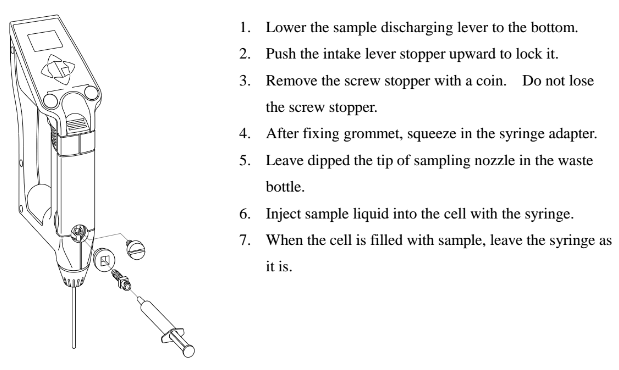 Press down the sample discharging lever all the way and remove the syringe cover by pulling it toward you as illustrated. Turn the syringe 45degrees counter clockwise to release it from the o-ring. Slightly pull the sample drain-out lever toward you to pull out the syringe from the o-ring. Remove the syringe from the drain rack and replace it with a new one. 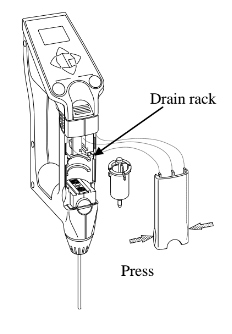 Pull down the drain rack and insert the o-ring and turn it back clockwise until it stops. Place the syringe cover back on the unit. The maximum number of data which can be stored in the DA-130N memory is 1,100 samples. Data can be set to be saved automatically or manually after each test. 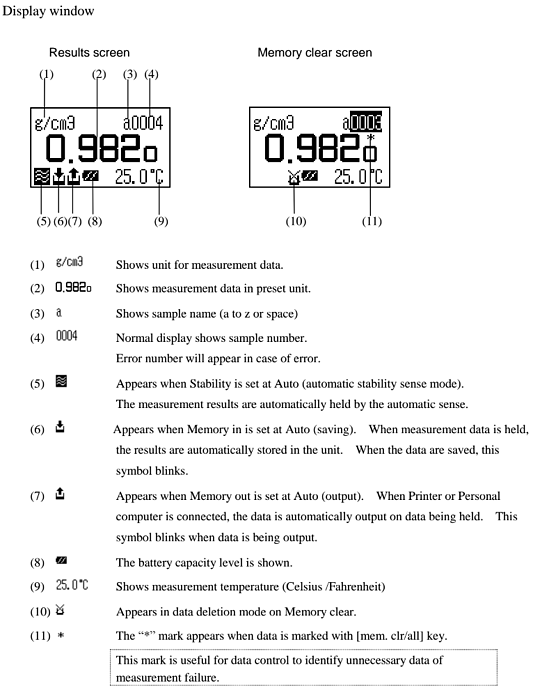 You can recall stored measurement data on the DA-130N display again or output the data to a printer or PC. We hope this information about this particula density meter is helpful. If you need other capabilities beyond a traditional portable density meters refer to other bench top density meter models for increased accuracy. This is a quick guide to getting started and running your first test. We thought it would be helpful for those getting started and checking their first calibration before running tests with actual samples. 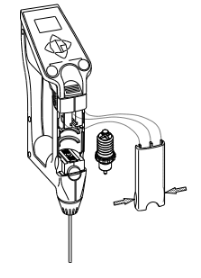 We will also continue to explore and share more information about calibration options, general maintenance, and data export methods using the DA-130N portable density meter in future posts. ...And then attach the sampling nozzle. Leave the temperature unit (Celsius), measurement unit (g/cm3) and mode (Field) as initial values. Sample pure water using the built-in syringe. Make sure the sample discharging lever is pushed down to the bottom. If not, slowly push it down with your thumb. 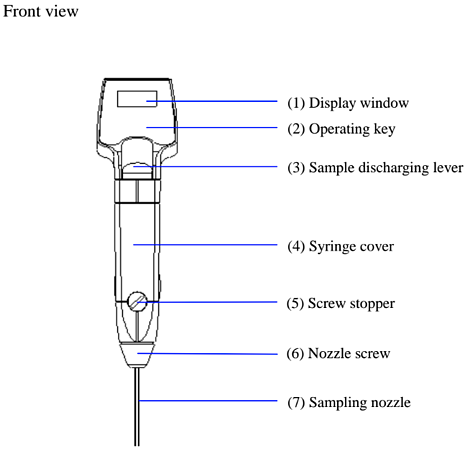 Dip the sampling nozzle in the sample liquid. Slowly pull the sampling lever with the forefinger. When the cell is filled with sample, release your finger. After the measurement cell is filled with sample liquid make sure there are no air bubbles in the cell. If no air bubbles are visible then let's proceed. When working with samples under 2,000mPa.s of viscosity but where samples contain particles or grains that may crystallize when dry we suggest you use the supplied bellows pump (swap out the built-in syringe for this). 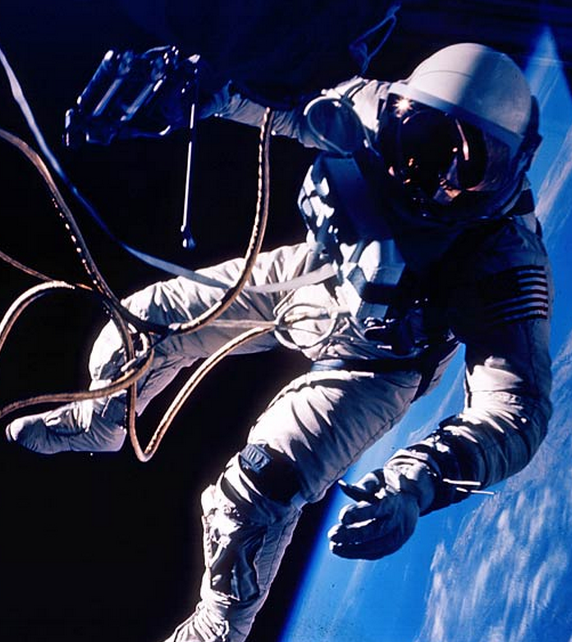 purposes and earth’s known gravitational pull we will define Mass as weight. For liquids, temperature is an important factor that can affect a liquids density. Therefore we generally will always describe density at a given temperature for comparison purposes. In general, as liquid temperature increases, density decreases. Knowing the density of a liquid serves numerous purposes and can provide valuable information for making decisions. Understanding what density is, what affects density, and how density affects other physical properties is important in using and translating this information into an everyday useful tool. We can use either a hand-held density meter or benchtop density meter to evaluate a liquids density or specific gravity. properties is helpful to those who need to use the information. >How much space does it take up? >How much of this can we put into that? >Many everyday products are packaged by volume but sold by weight. >Predictive correlations can be made if you know the density. >If we change some of the ingredients that make up the fluid property will it change the weight? >what is the volume of the liquid? >What is the density of the liquid? But also, What is the liquid? 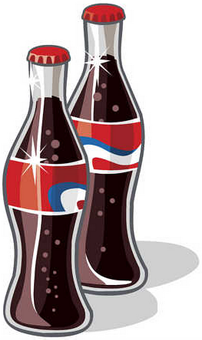 correlations provides useful information in the production of many beverages. 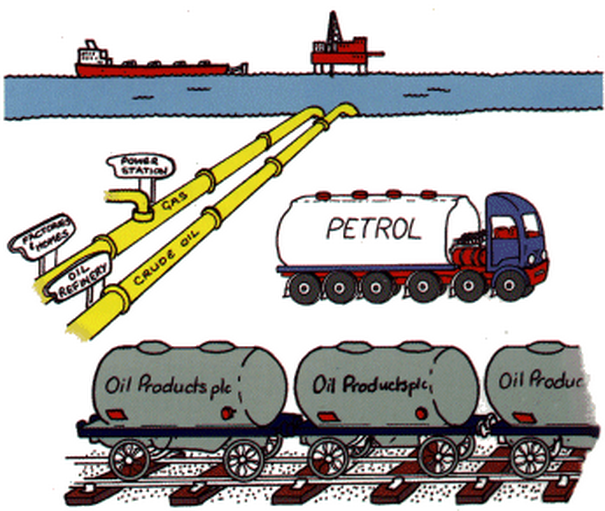 be a bigger tanker truck, or for a pipeline it may be a larger transfer pump. the price of the gasoline, for example. 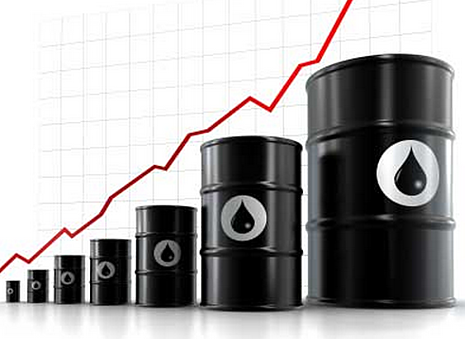 In the oil industry quantities of crude oil are measured in metric tons. number of barrels per metric ton –a common term of measure in the industry. To further explore and expand the usefulness of density measurement we focus our attention on two types of gravity. Specific gravity is another way of saying density relative to a given reference material. lighter than water and is why this oil floats. have a specific gravity somewhere between .99 and 1.01. Who knew? therefore determine the value of the product. many or our industrial and production processes.